April 2016 sees the start of quarterly expansions of one of the best competitive card games around. Two expansion decks release in April 2016. Expect new expansions every three months. Big box expansion with two new types of magic coming in next November. Official Organized Play kits arrive in April. Ashes: Rise of the Phoenixborn is one of my favorite games of the year. While the core box comes with a number of Phoenixborn and a fun drafting system that has kept me satisfied for months, I’m getting antsy for new decks. Well, we’re all going to have to wait a bit longer for Ashes expansions. Plaid Hat Games announced the release schedule for the expansions, which begin April 2016. The first expansions come in the forms of two new decks. The Frostdale Giants features Phoenixborn Rin Northfell and is a natural magic deck. The Children of Blackcloud deck stars Brennen Blackcloud and is packed with ceremonial magic cards. Each expansion will cost $14.99. Pre-orders for both decks go live on the Plaid Hat Games site in February and come with a bonus Phoenixborn, Lulu Firststone, who apparently wasn’t cool enough to get her own deck. Her special, Bolster, which adds +1 attack value to all your units for the turn, ain't too shabby. From there, we can expect new Ashes decks about every three months. The next two decks come in August at GenCon and focus on illusion and charm magic. And here’s the big news, folks – in November, we get a big box expansion with four decks and the introduction of two new types of magic/dice. Sympathy and Divine magic come into play. I can’t wait to say, “Sorry for your loss” whenever I kill an opponent’s units with my Sympathy deck. Plaid Hat also teased official Ashes Organized Play (with play mat, a dozen alternate art Conjuration cards, and alt Phoenixborn art). The kits will be available with the release of April’s expansions, so in the new year expect more details and a sneak peek at the goodies participants can claim. 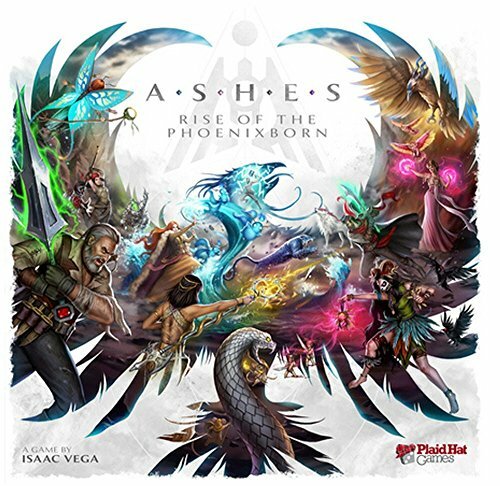 Will Ashes: Rise of the Phoenixborn win Dog and Thimble’s Game of the Year 2015? We’ll reveal our nominees next week! Stay tuned.